Isn’t it funny that even up to now, despite the many advances in cloud computing, file sharing and uploading which can be accessible on various platforms, many people still prefer to share files through email? So to remedy this and offer its customers a convenient way of sharing files, SugarSync, a file syncing solution is offering a subscription service which would only cost you $4.99 a month. The new SugarSync feature will let you email files to your friends and business contacts easily from any computer terminal and other mobile devices such as your smartphones. After emailing the file attachment, SugarSync syncs them with your other SugarSync interface. The new service is being offered as an opt-in feature which will allow you to disable and enable it anytime you want to. Upon signing up for the service, SugarSync will provide you with an email address where you can send your files. This email address are spam-free since it is composed of randomly generated numbers. If you want to try the feature, you need to enable it from your SugarSync account settings. Once you’ve enabled the feature, the unique email address will be given to you. And to make it easier for you to use that email address, you can instruct SugarSync to send you an email containing the email address so that you can easily add it to your email contacts. 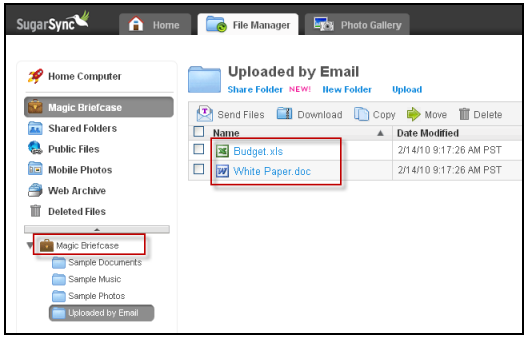 Once you’ve uploaded files, these will be stored in your Magic Briefcase, specifically in a folder labelled “Uploaded by email.” This folder will be automatically synced to your SugarSync account so that you can access it from anywhere. Hey there, I’m Spencer. I work for a company named Syncables, and after reading through this, I think you might want to check us out. We make a localized syncing software that I’ve found makes a great compliment to sugarsync. Our client is cross-platform, and it lets you keep your files, contacts and email synced between your computers over your home or office network, which is great for when you can’t get an internet connection but still need to transfer things between your machines. Additionally, Syncables includes a media component, which allows you to upload your media to any phone or usb drive.